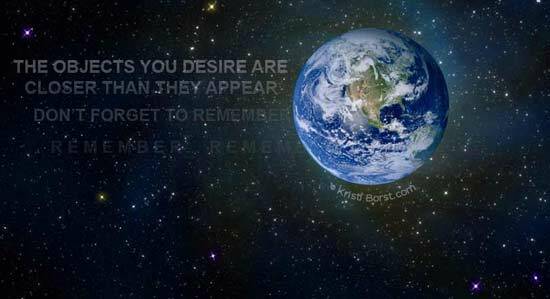 Healing Resonance Articles by Kristi Borst: How Far Would You Travel For Inner Peace? How long have we thought this way? We have been told by science, even through religion, that we are "Just A Spec on the Earth". You believe you are separate from, well, Life itself. How can that be? How can someone else, another of You be more important than the other? Yes, I said "You". I am included in that all-inclusive You just as you are! Each of us is part of the whole. Like a brick is to the wall. When you remove even one brick (particularly if you imagine others have been removed before it), that wall could shatter. That one brick could be pivotal ... IS pivotal to the overall system of balance. We each/all hold unique and individual importance. We do not experience life the same as another nor in total awareness of what the other experiences. Even identical twins experience some aspect of their shared life circumstances differently. This unique perspective and experience is largely why we are here in separation. yet this is a time of being more awareness to the whole You. I have experienced myself that when live in our authenticity, we not only connect more fully to Source / God / The Universe, the more we experience Inner Peace ... Heaven on Earth, right here, right now! How? Merely by being ourSelves! Unfortunately, most of us have thought the Just A Spec" existence was the only way It Is. [Some could say it was the way It Is because with thought we were Just A Spec. It's truly one of those "Chicken and Egg Scenario" situations. You are what you believe, and you believe what you are.] I'm inviting you to snap your fingers and visit a different perspective. Imagine "the objects you desire are closer than you think!" The feelings you desire are closer than you think. The health you desire is closer than you think. The happiness and joy you desire are closer than you think. Ultimately, when we catch a glimmer or hefty dose of that amazing, blessed, yet largely unconscious connection to everything ... How can we continue to believe we are Just A Spec? Thankfully, those who are sensitive to Universal Energies within themselves and places on our Earth and messages from Higher Realms share that things are lightening up ... The Veil between our humanness and the Spiritual Truths is thinning. I believe this lifting of density is a lifting of the illusion. I believe this dynamic, continual shifting toward Love is part of the re-awakening and expansion of my Divine Higher talents. The more I open to it, the more it grows within me, through me, as me. It is an unfoldment without effort, I am unfolding unto myself, unto all Self. Yes, the energies are supporting and also catalyzing change. Many others are finding their gifts. Have you begun to find your gifts? Have you claimed them? Or, are you frantically searching? It's an ongoing and evolving process! But, if you are frantically searching, you are likely looking in the wrong direction. You are in a rabbit hole, playing Hide and Seek with yourself; you've been facing deeper into the hole. I am in that rabit hole too, but my eye is firmly on emergence and I'm shining the way for others before and behind me. Actually we're illuminating one another! The more we see the story, box, quest, relationship imbalance, the more we are able to choose whether it will have our power, energy, focus. Therein lies our power as that Brick. It is in our peace and being our true calm, loving self that all balance is restored. First within and spilling out of us into the world. It's a virtual well spring! Inner peace continues to be my personal focus. As I recognize things that take me away from Inner Peace, I heal them. I love them free and I become Free. The unfoldment within breathes through life as an ever-expanding space in which to Be more joyous. Inner Peace. How far would you travel for Inner Peace? "The objects you desire are closer than you think. Don't forget to remember .... remember ... remember." Remember the larger story! Remember who you are and your importance here. Do not remain in that rabbit hole facing downward, as it's much darker there than need be. Remember ... reconnect ... expand .... heal ... rinse ... repeat! PS One of my abilities is helping others reconnect to peace and the gifts already there, within. Spiritual messages come in private session work which serve as short cuts, doorways, stairways, and time capsules in and through unfoldment and Self Mastery. In addition, I now offer a one-hour activation and release Kore HealingSM with Kristi ~ "Inner Peace Activations ~ Release of Negativity". This session is available for you 24/7, as your choice of single-engagement or permanent download. This healing shifts energies within, offers activations and releases to provide a Perspective Reboot® on external factors that have previously affected our Inner Peace.